This section contains details of past events. You can also view Roger Scrivens’s presentation on the first 50 Marine Measurement Forums here. The Steering Group for the Marine Measurement Forum (MMF) announces that the 60th MMF, held at the LandRover BAR (Ben Ainslie Racing) facility in Portsmouth was an all-round success with an entertaining programme matched by the wonders of the hi-tech venue. The MMF60 organisers, iXblue are to be congratulated on registering just short of 90 attendees and for assembling a diverse programme. A more detailed report on the day’s event will follow shortly. The Marine Measurement Forum (MMF) travelled to the industrious Eastern Docks of Southampton, UK for the 51st meeting which was held onboard the preserved steamship S.S. Shieldhall on 5th December 2012. This unique historic venue was selected by the event host The Hydrographic Society UK (THSUK) who provide a forum for those involved in maritime activities related to the Hydrographic industry. In her ‘hay-day’ the Shieldhall, built in 1954, regularly carried treated sewage along the River Clyde to deposit sites at sea, while at the same time hosting many parties on her decks. The Shieldhall left the Clyde in 1971 after 21 years of service and relocated to Southampton Waters where she continued to work until 1985 when services were stopped due to rising fuel prices. Today she is the largest working steamship in Northern Europe and is now preserved by volunteers to hold events such as MMF51. Fifty-six delegates from a diverse range of industries joined THSUK for an interesting day of knowledge exchange, highlighting significant advances in the marine sector. A total of 12 speakers delivered in-depth presentations covering a wide range of topics. The first session entitled Industry Update and Training, opened with Roger Scrivens of RS Aqua Ltd firstly presenting an annual review of UK marine scientific industries. Roger’s second presentation of the day was a light-hearted anecdotal account of tales from his 40 years in the marine measurement industry. This included tales of past Hydrographic Society meetings, the trials and tribulations of buoy deployment during Operation Iceberg and many more, bringing much nostalgia and laughter to all. Roger was followed by Chris Harper of IIC Technologies who gave a detailed report into the future training of the digital generation and how teaching methods are being adapted to suit different styles of learning. After a coffee break the second session of the day entitled Hydrography, was opened by Dr Steve Taylor of Geomatix Ltd who presented an insight into the tidal prediction work carried out on the tidally constricted Sharpness Dock, Gloucester. Tom Broomfield from ABP Southampton followed with an overview of how a multibeam Sonar system is utilised within the Port of Southampton to maximise data collection and dredging efficiency. The benefits of using a multibeam system was further emphasised through the incorporation of numerous exciting images and charts which have been produced from data collected from around the port. The final presentation of this session was delivered by Malcolm Bowdidge of ABP Marine Environmental Research who described how various monitoring and surveying methods have been involved with mitigation, investigation and research projects along the South Coast of England. The end of the second session signalled lunchtime on board the Shieldhall and delegates enjoyed an extensive buffet whilst being able to walk around the ship and network with others. 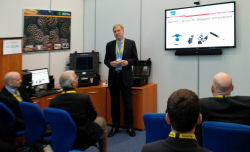 John Lewthwaite of IMAA Ltd opened the third session of the day entitled Equipment and Software, by speaking about the development of The On-Board Motion Sensor (TOMS) for operators of small crafts, such as the Royal Marines, who are exposed to whole-body vibrations. John was followed by Adil Ali from Seatronics Ltd who described how stains and flexing of large subsea structures can be monitored whilst they are lowered and positioned on the seafloor. Nick Lawrence from EdgeTech concluded this session by giving an account of recent developments in phase differencing bathymetric sonar systems, providing an interesting overview of interferometer benefits through data examples and analytical techniques. After another refreshment and networking break the final session on Practical Experiences was opened by James Williams from Swathe Services Group, who presented an extensive and fascinating comparison of a GeoSwath Bathymetry System and a Sonic 2024 when mapping underwater archaeological sites in Plymouth Sound. Matt Linham of EMU Ltd followed, giving a detailed explanation into the benefits of long-term strategic monitoring campaigns which allow for effective adaption to coastal change. The final speaker of the day was Lisa Symes from Subsea Asset Location Technologies (SALT) Ltd, who stepped in at short notice to give an extremely interesting presentation on how their product, the SonarBell, works and its applications within the industry. Along with several other delegates it was my first attendance to an MMF event. It was an experience which I thoroughly enjoyed and will certainly be among the MMF community for future events. The MMF has undoubtedly increased my own knowledge of new practices and developments and given everyone present, a chance to catch up with old contacts and make new ones within the marine industry. All 12 presentations form the 51st MMF are available to download at the THS website.